I make some sort of hummus every week now, it is something that I have to have on hand so I can snack on it with veggies and use it as a spread for sandwiches. So last week, I was checking the cupboard for which types of beans I had, and I came across some dried black turtle beans. Perfect! I thought I would combine them with some peanut butter and cilantro as well as some lime juice and make a different sort of hummus than the usual middle eastern inspired one. I blended all the ingredients together and I decided that the murky black color of the hummus was rather ugly. So I threw in a beet for good measure, and beautiful color, as well as added nutrients. I have used beets before in hummus, and those are often my favorites(one of which I have posted on this blog, if you are interested)...as this turned out to be. I know it sounds like a wierd combo to pair beets and black beans, but this stuff is addictive! I especially love it with cucumbers! So, if you are looking for something a little different in the line of hummus, here you go! In a food processor, combine all ingredients and process until smooth. 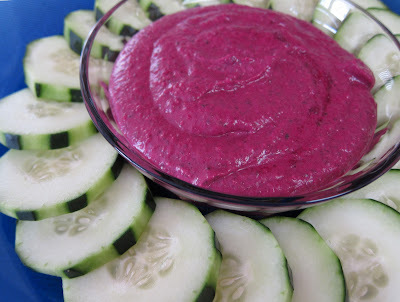 Serve with chips or veggies for dipping! I'm sold on the colour alone but the ingredients tell me this will be delicious as well as good for you!